"My family has been taking our pets to Brockton Animal Hospital for nearly 35 years! We drive a good "commute" from Norwood because they provide the best care around. They are caring, professional, and will always go the extra mile. We consider Dr. Hirschberg to be part of the family!" "Brockton Animal Hospital is THE absolute best place you can take your furry family member! They treat all pets ('clients') with love, attention and such care. Before finding BAH, our dog was diagnosed with luxating patella, and I wanted to get second and third opinions before I moved ahead with any type of procedure. LLoyd's (our previous vet) jumped from A to Z in their diagnosis and never followed up with me; they also prescribed pills to her which were unnecessary. When I stumbled upon Dr. Hirschberg's office - my puppy and I immediately received the utmost respect and attention. I emailed Dr. Hirschberg with my concerns and in less than two hours he got right back to me- via email and a follow-up call. He spoke to me about alternative methods to surgery, and that we may as well try those before jumping right into a procedure. When we met with Dr. Hirschberg, he really helped us to understand our dog's diagnosis, walking us through the potential procedure; and explained everything in detail so we could understand thoroughly. Our dog LOVED Dr. Hirschberg and his staff instantly - which is quite a rarity since she is scared of most things! We went ahead with Dr. Hirschberg's plan and tried laser/light therapy which did seem to help a bit (Lloyds NEVER even mentioned this pre-surgery method), and it drastically helped during our dog's recovery time after the procedure. Before the procedure, Dr. Hirschberg calmed all of our fears and gave us specific details for what to expect before/during and after our dog's surgery - this was extremely helpful! Dr. Hirshberg and the staff would call to find out how our dog's recovery was going, and each time when we brought her in they truly cared about her well-being. I honestly can't say enough great things about BAH and would recommend them to EVERYONE who wants great, honest and thorough care for their pet. We will never go anywhere else! I wish Dr. Hirshberg could be my own doctor! 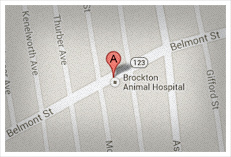 :)"
"I have brought my animals to Brockton Animal Hospital for over 28 years now. I appreciate the vast knowledge that the veterinarians have and their ability to diagnose what illness, disease or medical issue my pet is having usually without a lot of expensive testing. I have had many pets that have had complicated surgical or medicall issues the kinds of issues that are not common. These veterinarians have performed miracles surgically for my animals on more than one occassion. They are knowledgeable and up to date on current treatments and protocols and have modern equipment including laser therapy that has helped many animals. The staff is alway professional and friendly. I have never had a bad experience. They answer their phones and get back to you in a timely manner if necessary. I have always been very impressed with the way they treat my animals. I did move further away from their office but I continue to commute as I trust them with the care of my animals. When you find a great doctor with a great staff you stick with them because exceptional service and trust is hard to find these days. They really care about their clients and it shows." "Always sincere with care. Kept me on track with my cat. ?" August 18, 2016 Mary J. "I've been very impressed with the Brockton Animal Hospital and drove all the way from Boston to bring my dog to see him. I was referred to Dr. Hirschberg because he is one of the few vets in Massachusetts who specializes about laser therapy for dogs suffering from joint disease and hip dysplasia. He was completely up front with me and said, "I think this has a 80% chance of working for your dog and let's try three visits, and if it doesn't we'll move onto other options." I appreciated his honesty and respect for not wasting money. But what even impressed me more was his willingness to listen and look at the big picture of my pet's health history, and really want to explore to see if other factors would be contributing to his problems. I also appreciated his not wanting to immediately say, "Do an expensive surgery on your dog!" Which some vets may push right away. He is open to exploring options and really making sure my dog had the right diagnosis and also is getting the right kind of care. His level of care and compassion is A+."